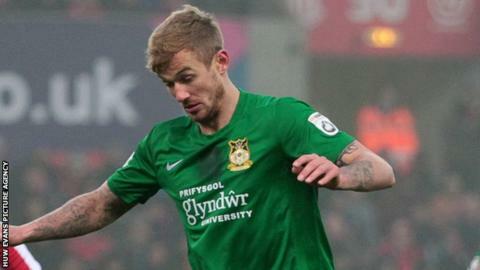 Nine-man Wrexham held out to secure a point at National League title chasers Forest Green Rovers. Forest Green dominated and James Jennings' header was cleared off the line by Robbie Evans. Wrexham were reduced to 10 men when Blaine Hudson was sent-off for a professional foul on Kurtis Guthrie. Hudson was followed three minutes later by captain Connor Jennings, who received a second yellow card. Gary Mills' side remain three points adrift of the play-offs while Forest Green are five points behind leaders Cheltenham Town. "We had chances, but it's about putting the ball in the back of the net. It wasn't for a lack of trying today. "At half time, more than anything else, we just wanted to get more players forward. But every time we got the momentum up, the referee seemed to kill the game for us and it was very frustrating. It happens, it's football. "We dust ourselves off now, it's another point on the board but obviously we wanted all three." "When your team plays like that, as a manager you're proud. It's a massive point for us. "Nobody wants to play us at the moment and we've proved with nine men we're not about to give in. "We deserved the point. It's an unbelievable point for us." Match ends, Forest Green Rovers 0, Wrexham 0. Second Half ends, Forest Green Rovers 0, Wrexham 0. Attempt saved. Jon Parkin (Forest Green Rovers) left footed shot from the centre of the box is saved. Offside, Forest Green Rovers. Charlie Clough tries a through ball, but Charlie Clough is caught offside. Attempt missed. Kurtis Guthrie (Forest Green Rovers) right footed shot from the centre of the box is too high. Assisted by Marcus Kelly. Attempt missed. Kurtis Guthrie (Forest Green Rovers) left footed shot from the centre of the box misses to the left. Foul by Kieffer Moore (Forest Green Rovers). Substitution, Forest Green Rovers. Kieffer Moore replaces Elliott Frear. Attempt blocked. Darren Carter (Forest Green Rovers) left footed shot from outside the box is blocked. Attempt saved. Elliott Frear (Forest Green Rovers) left footed shot from the right side of the box is saved. Substitution, Wrexham. Ryan O'Reilly replaces Kayden Jackson. Attempt saved. Darren Carter (Forest Green Rovers) left footed shot from outside the box is saved. Second yellow card to Connor Jennings (Wrexham) for a bad foul. Foul by Connor Jennings (Wrexham). Attempt blocked. Marcus Kelly (Forest Green Rovers) left footed shot from outside the box is blocked. Blaine Hudson (Wrexham) is shown the red card. Substitution, Forest Green Rovers. Jon Parkin replaces Keanu Marsh-Brown. Aarran Racine (Forest Green Rovers) wins a free kick. Substitution, Wrexham. Wes York replaces Javan Vidal. Attempt saved. Elliott Frear (Forest Green Rovers) left footed shot from the right side of the six yard box is saved. Connor Jennings (Wrexham) is shown the yellow card for a bad foul.